Finally! A 12v electric wiper kit that is a direct replacement for the old electric or vacuum wiper motor that mounted to the outside of the closed car windshield frame. The windshield can still be opened (about 2-1/2 to 3 inches) for fresh air. Motor will accommodate mounting hole spacing 4-1/4" to 5-1/8." Motor protrudes out from windshield 4-1/8." Motor has automatic stop position. Kit comes with motor, wiper arm, blade wiring, switch and instructions for mounting. Switch is concealed behind dash rail. Finally! A 6v electric wiper kit that is a direct replacement for the old electric or vacuum wiper motor that mounted to the outside of the closed car windshield frame. The windshield can still be opened (about 2-1/2 to 3 inches) for fresh air. Motor will accommodate mounting hole spacing 4-1/4" to 5-1/8." Motor protrudes out from windshield 4-1/8." Motor has automatic stop position. Kit comes with motor, wiper arm, blade wiring, switch and instructions for mounting. Switch is concealed behind dash rail. 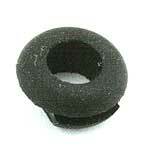 If you need just the bowl gasket for your Trico vacuum wiper motor but not the whole kit. Made in USA. Vacuum Wiper Mounting Screws for the 1930-31 Closed Cars. 1 1/2" long. Vacuum Wiper Mounting Screws for the 1930-31 Open Cars. 1" long. 12v to 6v Electric Wiper voltage resistor. You will need this when converting to 12v if you want to retain your standard 6v wiper motor. Use this special arm with the aftermarket A-17500-E6 wiper motor. You can use the regular A-17528 or the A-17528-B blade with this. Made to clamp down on a shaft that is.235" in diameter. This is a universal 6 Volt motor that mounts on the inside of the car. The shaft is sleeved and threaded to hold it in place. Does NOT include wiper blade and arm. 110 Degree Sweep. Black Housing with on / off switch. The shaft can be adapted from the 3 1/4" to 2 1/2" if necessary. Unless you adapt the motor to go thru the windshield frame with an angled hole, you will not be able to open the windshield. For arms and blades for this motor, we suggest A-17529-C Arms and A-17528 or A-17528-B Blades." On an original car, it is best to find original wiper motors and use this as a last resort. A universal style wiper motor with a polished stainless motor cover. Shaft is 5" long and can be shortened. Instructions included for shortening. Uses A-17529-C wiper arm and A-17528-B blade. Switch not included. This is a universal 12 Volt motor that mounts on the inside of the car. The shaft is sleeved and threaded to hold it in place. Does NOT include wiper blade and arm. 110 Degree Sweep. Black Housing with on / off switch. The shaft can be adapted from the 3 1/4" to 2 1/2" if necessary. Unless you adapt the motor to go thru the windshield frame with an angled hole, you will not be able to open the windshield. A-17529-C Arms and A-17528 or A-17528-B Blades. This is a universal 12 Volt motor kit that mounts on the inside of the car. The shaft is sleeved and threaded to hold it in place. Does NOT include wiper blade and arm. 110 Degree Sweep. Black Housing with on / off switch. Supplied complete with arm and blade. This stainless 12-volt wiper motor comes with the arm and the blade. It does not have a built in switch to operate it. If used on a model A closed car, you will not be able to swing windshield open. This is the same wiper motor as the A-17508-SS kit, but without the arm and blade. Polished stainless motor cover. Shaft is 5" long and can be shortened. Instructions included for shortening. Uses A-17529-C wiper arm and A-17528-B blade. Switch not included. Chrome plated hand wiper used on all open cars until Oct. Of 1928. Commercial A's until June 1930. shaft must be lengthened to work on closed cars. May be used on other vintage cars. Blade length 9 1/2", shaft diameter 1/4", shaft to end of blade 11". This Model T wiper clamp to fasten windshield wiper arm to windshield without drilling, but will fit any open car frame. Made in U.S.A.
Special nut used to hold the vacuum windshield wiper in place on the slant windshield model A's. Made in USA. Triangular Trico embossed tag. Made in USA. 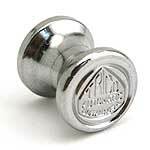 A chrome knob to replace a worn or missing knob. Made in USA. This chrome plated wiper knob has the 'TRICO' name and other info stamped on the face of the knob. Made in USA. Wiper Hose Grommet for the 1929-31. Goes in the closed car windshield frame where the vacuum hose passes through. Made in USA. Open Car Stanchion Line for the 1928-31 Standard Roadster & Phaeton. The chrome vacuum lone mounting on the left side windshield stanchion, comes with mounting clips. Made in USA. Open Car Stanchion Line for the 1930-32 Deluxe Roadster & Phaeton. This is the chrome vacuum line mounting on the left side windshield stanchion, comes with mounting clips. Made in USA. The small diameter hose for the wiper motor. 6 feet long. Made in USA. 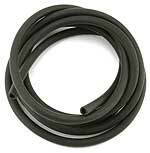 For the purist we can offer this simulated fabric covered wiper hose. 34" long. Made in USA. This is the 36" long vacuum line that goes from the firewall under the gas tank, and up the stanchion post on the closed cars. Cad plated flat steel arm made exactly like the original. This is a show quality repo for the original electric wiper motor. Wiper 7-1/4" Blade. 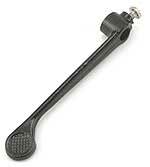 Fits all model A wiper arms as well as many others. This shorter blade is normally used on the 1928-29's. Wiper 8-1/4" Blade. 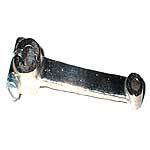 Fits all model A wiper arms as well as many others. This longer blade is often used on the 1930-31 models. Hook type windshield wiper blade - 9" Long for the 1940-48 American Ford V8. Authentic style 8 1/4" electric Wiper Blade for the 1928-Early 29 for A's with electric wiper motors. Designed to use cotter pin hole for attaching. 8-1/4" single ply, nickel plated. Coupe/Sedan. Made in USA. Authentic style 8" electric Wiper Blade for the 1928-Early 29 for A's with electric wiper motors. Designed to use cotter pin hole for attaching. 8" nickle plated, single ply and was used on 1928-Early 29 open cars. Authentic style 8 1/4" electric Wiper Blade for the 1929-30 A's with electric wiper motors. Designed to use cotter pin hole for attaching. 8-1/4" contoured top, multi-ply, nickle plated design that was used on all cars from 1929-30. For the model A`s that had the vacuum wiper motor mounted outside the car. Universal style that is to be used with A-17528 or A-17528-B blades. For the model A`s that had the vacuum wiper motor mounted inside the car. 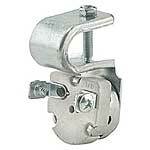 Universal style that is to be used with A-17528 or A-17528-B blade. Very well detailed authentic style vacuum wiper arm. Fits 1930-31 Standard Open cars, Sedans & Coupes. 6-3/4" finished in black. Made in USA. Fits 1930-31 Deluxe Open cars and 68B Cabriolet. 6-3/4" in chrome. Made in USA. Fits 1931 Cabbriolet and A400. Covered top style arm. 7-1/4" stainless. Made in USA. Fits 1931 Standard Slant Windshield Sedans, 8-1/4" in black. Made in USA. Fits 1931 Standard Slant Windshield Sedan and Victoria. 8-1/4" in chrome. Made in USA. For the purist, we offer these authentic style wiper blades. Must be used with authentic style arms. 8-1/4", black, single rivet. Used on closed cars & standard open cars. Made in USA. For the purist, we offer these authentic style wiper blades. Must be used with authentic style arms. 8-1/4", chrome, single rivet. Used on deluxe open cars, Victoria and A400's. Made in USA. The on-off control that passed through the windshield frame for the outside mounted wiper motors. Made in USA. A brass double female connector that attaches to firewall for the inside and outside vacuum lines to connect. Made in USA. A steel vacuum line with the brass fitings that runs from the intake manifold up to the firewall. Made in USA. Vacuum Line Fitting for the model A wipers and also for the V8 distributor vacuum. Wiper Clamp set for the 1928-31. Chrome clamps for holding the windshield wiper motor to the windshield frame. Open cars only. Authentic Style Wiper Clamp Set. Used only on 1928 open cars for mounting the electric wiper motor to the frame. Made in USA. Authentic Style Wiper Clamp Set. Used on 1929-30 open cars for mounting the electric wiper motor to the frame. Made in USA. 1928 Closed End Wiper Mounting Boot set. These rubber boots slipped over the mounting ears of the electric wiper motors. This closed end style was used on the early 1928's. Made in USA. 1928-30 Open End Wiper Mounting Boot set. These rubber boots slipped over the mounting ears of the electric wiper motors. Wiper boot Plate set for the 1928-30. Used on the later closed cars. Mounts on top of the wiper mounting boot. They were painted black originally. Made in USA. Holds the windshield wiper motor wire to the header. 3 required. Made in USA. These clips hold the wiper hose in place under the windscreen hinge. The same screws that hold the windscreen hinge, hold these clips. set of 3. Wiper Motor Felt 1928-30. Used on all closed cars between the wiper motor and the windshield frame. Fits 90% of motors. Made in USA. This is a special clip that holds the electric wire on the open car windshield frame. For open cars only. Made in USA. Screws on the windshield to hold the wiper hose on Roadsters, Roadster Pickups and Phaetons. Made in USA. Used on all of the original electric wipers for connecting the wire to the motor. Wiper Motor Bracket for the 1930-31. Used only on the A-400's to atach the wiper motor to the windshield frame. Made in USA. Wiper Blade Arm Support 1928 Black. Supports the wiper arm on the open car electric wiper motors. Made in USA. Wiper Blade Arm Support 1929-30 nickel. Supports the wiper arm on the open car electric wiper motors. Made in USA. Nickel plated Wiper Blade Arm Support for the early 1928. 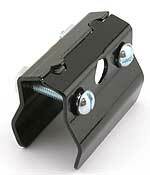 Supports the wiper arm on the closed car electric wiper motors. Made on USA. 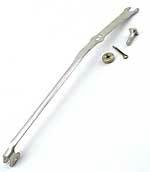 Nickel plated Wiper Blade Arm Support for the 1929-30 models. Supports the wiper arm on the closed car electric wiper motors. Made on USA. Nickel plated wiper manual control Lever for the 1928-30 closed cars. Operates the electric wiper motor by hand. Used on the 1928 open car electric wiper motor. Has a slight dog leg at handle end. Made in USA. Used on the open car electric wiper motor. Arm comes off edge of shank instead of being centred like the A-17576 style. Wiper On-Off Lever for the 1929-30 in nickel finish. This style was used on the open car electric wiper motor. Turned the wiper motor off and on. Made in USA. Wiper On-Off Lever for the 1929-30 in Black. This style was used on the open car electric wiper motor. Turned the wiper motor off and on. Made in USA. Heinze / Ames Wiper Idler Gear. The thin fibre idler gears used on the electric wiper motor. The Heinze gear is the same as the Ames and is 1.280" in diameter and .100" thick. Owen-Dyneto Wiper Idler Gear. Thin fibre idler gears used on the electric wiper motor. The Owen-Dyneto is a smaller gear which is 1.028" in diameter. and .100" thick. Cast aluminium cover that fits the OD-C1 Owen-Dyneto wiper motor that was used on the 1928-30 closed cars. Not machined or drilled. Made in USA. Cast aluminium cover that fits the Owen-Dyneto OD-02 wiper motor that was used on the 1929 open cars. No holes. Made in USA. Fits the Owen-Dyneto model OD-03 and OD-C3. Used on 1929-30 open & closed cars. Not dilled or machined. Made in USA. Owen Dyneto motor cover. Used on OD-01 models which were used for 1928-29 open cars. Cast aluminium. Made in USA. Script base used on the Owen-Dyneto OD-C1A electric wiper motor. Early 1928 closed cars only. Cast aluminium. Made in USA. Used on the Owen Dyneto OD-C1 which was used on 1928-29 closed cars and on the OD-01 which was used on 1928-29 open cars. Made in USA. Used on the Owen Dyneto OD-C2, OD-02, OD-C3 and OD-03. 1929 and 1930 open and closed cars. Cast aluminium. Made in USA. Tandem Wiper Kit 1928-31. Let your co-pilot see what's going on. This kit will adapt to your original wiper motor, and give you tendem wipers! For inside mounted motors. (Not for our universal wiper motor kit).